Explore the Media Watch on Climate Change to track the latest news and social media coverage on climate change and related issues. 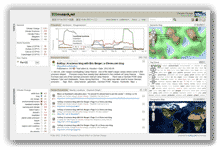 The dashboard visualizes environmental information flows across news media sites, blogs, Web 2.0 platforms (Facebook, Twitter, Google+, YouTube), environmental organizations, and Fortune 1000 companies. 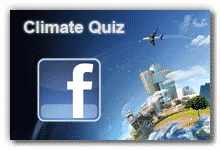 Compete with other users and play the Climate Challenge, which is the successor of Triple-C’s Facebook application. Both follow the tradition of “Games with a Purpose”, inviting users to contribute to a scientific project that aims to raise awareness and share environmental knowledge. The Climate Change Collaboratory (Triple-C) aims to strengthen the relations between environmental stakeholders who recognize the need for climate change adaptation and mitigation, but differ in their specific worldviews, goals and agendas. For this purpose, the collaboratory provides tools to manage expert knowledge as well as a context-sensitive environment for creating and editing documents in a collaborative manner. Building upon the award-winning technology behind the Media Watch on Climate Change, the user’s semantic context is provided by a real-time synchronization framework for rendering advanced visualizations including information landscapes, geographic projections, and ontology graphs. Innovative survey instruments in the tradition of “games with a purpose” create shared meaning through collaborative ontology building, and leverage the extensive user base of social networking platforms to capture indicators of environmental attitudes, lifestyles and behaviors. Two project workshops help align Triple-C with the research activities of its associate partners, increase the project’s visibility, and foster the collaboration with leading international organizations. For this purpose, the collaboratory provides tools to manage expert knowledge as well as a context-sensitive environment for creating and editing documents in a collaborative manner. 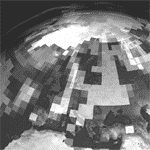 Building upon the award-winning technology behind the <a href=”https://www.ecoresearch.net/climate/” target=”_new”>Media Watch on Climate Change</a>, the user’s semantic context is provided by a real-time synchronization framework for rendering advanced visualizations including information landscapes, geographic projections, and ontology graphs. Innovative survey instruments in the tradition of “games with a purpose” create shared meaning through collaborative ontology building, and leverage the extensive user base of social networking platforms to capture indicators of environmental attitudes, lifestyles and behaviors. Two project workshops help align Triple-C with the research activities of its <a href=”/nmt/triple-c/partners”>associate partners</a>, increase the project’s visibility, and foster the collaboration with leading international organizations.